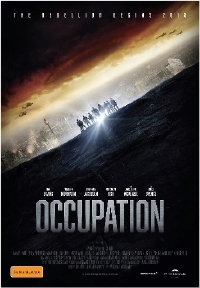 Late last year, we had our first look at Occupation, an alien invasion thriller coming from Film Mode Entertainment which was screening at the American Film Market. The movie, co-written and directed by Luke Sparke, tackles the familiar invasion trope by setting it in Australia and peppering it with some impressive special effects from the team behind The Hobbit and The Matrix movies. The result is a movie which is far better looking than your average low-budget invasion flick. The movie stars a roster of familiar faces including Temuera Morrison (Star Wars), Stephany Jacobsen (Battlestar Galactica) Rhiannon Fish (The 100) and Bruce Spence (The Road Warrior) as survivors of the invasion who come together to fight back. It's a sleek looking trailer, showcasing the impressive visual effects, mixed in with acting that feels a little stilted. Hopefully the movie will overcome its weaknesses and manage to be entertaining; it certainly looks promising. Occupation opens July 12 in Australia. Saban Films has picked up North American distribution but no date has been set. An Aussie movie... with Kiwi accents and American attack helicopters??? Pretty sure we do not have Apache attack helicopters. I'm not an expert but I don't think they were Apache attack helicopters. They look like Tiger attack helicopters. As for Kiwi accents, I'm fine with that, lots of Kiwis live in Aus. As for the trailer, I'm surprised how good it looked. At first I though it was going to be cheap like Tomorrow When the War began, But it looks like they really tried to make it look like a war. I'll watch this on Netflix or something.